Map Editor 2.0 is the newest version of our tool for customization of weather maps. Map Editor interface is divided into three areas. Menu that allows you to switch between different states: overview of projects, layer editing, or changing of a specific project. Map which visually contains the visual map of the selected project. Workspace that displays a set of tools corresponding to the current state. 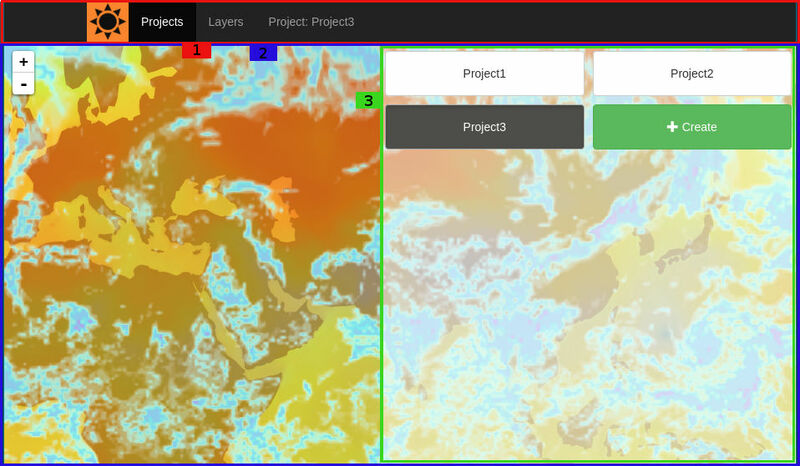 Project overview is the basic state of Map Editor. In this state, the workspace shows the list of all your projects. You can select a project by clicking the button with project’s name. On selection,map area will be filled by the map of the selected project, and the project edit link will appear in the menu. Moreover, it is possible to switch to project editing by re-clicking the button with project’s name in the workspace. Aside from the list of projects, "Create" button is present in the workspace. You can create a new project with it. Do not forget to supply project’s name on creation. In the editing state the workflow is divided into three sections. The upper part contains the following buttons. Save stores the current project state. Settings provides access to project’s configuration. 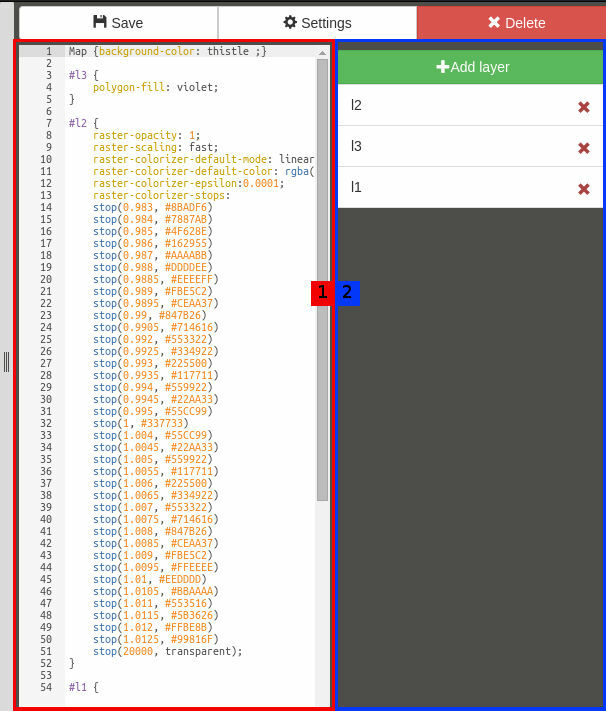 The remaining space is divided between the style editor and a list of layers. For narrow workspaces, style editor and a list of layers are stacked on top of each other and displayed as tabs. Style Editor is a text editor for editing map styles of the project using CartoCSS syntax. Layer list features tools for managing project’s map layers and shows a list of currently active layers. To add a new layer, click Add layer button. A dialog box will appear; you can select your desired layer and specify the name that will be assigned to it in your project. The layer can be removed by clicking the button with the X image, to the right of the layer name. Changing the order of layers is carried out via drag & drop. When drawing cards, the layers that are in the list above, overlapping the layers under them. Activate or deactivate the layer by double-clicking. Inactive layers still remain in your project, but they are not part of the rendered map. For the formation of the project card, you can use two types of layers. Custom layers - layers you've created, using data from remote servers. To create a custom layer go to the Layers state, by clicking on the link in the menu. The workspace is displayed with a set of tools for creating and editing layers. 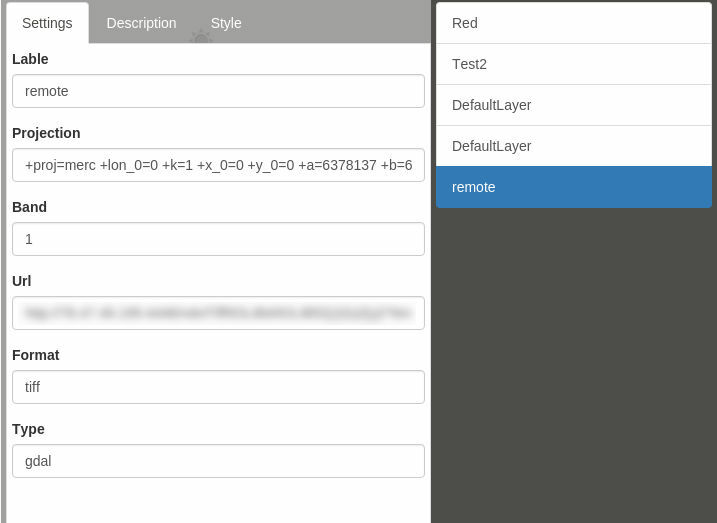 Below the buttons you can find the list of created layers as well as the form to edit the settings of the selected layer. In addition to the basic settings layer, this form contains tabs for editing the description of the layer and edit the style that will be used by default for this layer. The default style is automatically inserted into the design style with the addition of a layer.